We are grateful to be able to share lots of great news about what we’ve been working on here in Uganda! First, we hosted an orthodontist from Denver a few weeks ago — Dr. Anil Idiculla. 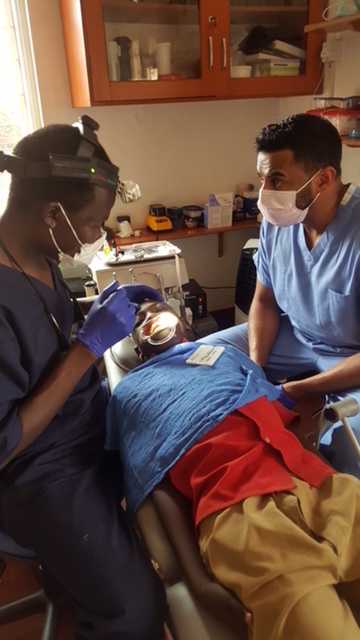 Dr. Anil’s passion and expertise was an awesome encouragement to us — he served alongside us by guiding our Ugandan dentists and me in the treatment planning/initial delivery of many orthodontic (braces) cases for patients. We are thrilled to be able to start offering braces to our patients! As a staff, we are excited about walking each of our patients through their journey towards a functional and beautiful smile! And we are thrilled to serve with Dr. Anil in the future — stay tuned for his report on his time in Uganda! We are always looking for people who share the same WHY for service as we do — this isn’t just work for us. It’s a calling. It’s something we are grateful to be able to do. And we want that to show in our work. And Dr. Anil has that same drive. That same WHY for using his talents to help people everywhere. So we are pumped to have Dr. Anil on our team — if you are reading this in the Denver area, go check out his Denver-area team — http://www.i-ortho.com/ — you will be happy you did. And we can’t wait for him to spend some more time with us in 2016! Another big piece of news — we are moving into new clinic space! We are moving across town very soon — whenever the renovations by the landlord are finished, and our new space will give us more room to see more patients and train and mentor more Ugandan dentists. We have made the most out of our current clinic space (a single 12′ by 12′ room) over the past few years, but we are long overdue to move into a bigger spaceâ€¦and we finally found the right fit! We will be providing pictures and more details of what our new space will allow us to do when it actually happens. Hopefully by the end of November, although you never really know when things will be done — the lease was originally supposed to start November 1! Our Hope Smiles team will be moving over with Dr. Charles and his medical team, and our larger health facility will allow other doctors to work under our roof as well. We think this will allow us to serve the overall health needs for our community more effectively! In anticipation of the move and increased patient load, we have added another staff member — Sandra. She will be helping David with sterilization along with acting as an assistant. She has been with us for 3 weeks now, and has proven herself to be highly motivated. We have high expectations for her future with Hope Smiles! That’s all for now. It’s been a really great year for us in Uganda. Never easy, but always good. Seemingly always struggling, but also building strength through the struggles. And most of all seeing what God has been doing here in Uganda, both with our individual team members and in the communities we serve long before I arrived here. I am grateful for all of the ways God has sustained us and protected us and helped us grow over the past few years.Â And we are hopeful for what He will do with us in the future. Thanks for your support with our work here — we wouldn’t be here without you. It’s hard to believe everything that has happened in just a few short years — raising the start-up money, getting everything up and running the right way here in Uganda, finding equipment, building our team, establishing our clinic, going all over the country on outreaches, outgrowing our clinic space rapidly, continually battling to find reliable equipment, hosting dentists from all over the world, now moving to a new clinic space, building our team some more (I could go on for a few pages here) — and through it all seeing God bring us through it. The work is often overwhelming, but mostly when I lose sight of WHY God called us together in the first place — to share the education and talents He has given me to help bring His kingdom more fully to Earth. We could do it anywhere on Earth, and somehow here we are in Uganda. It’s a little crazy when to think about, but we also know we are here for a purpose. He has given us a sphere of influence, and we desire to be a good steward of it. Things rarely happen according to the timing I would like. But I can see Him guiding us. Sustaining us. Protecting us. Refining us. Remembering that gives me joy when those overwhelming times inevitably come. We are grateful to be able to relieve pain, educate, and create healthy, beautiful smiles for our patients all over Uganda. We are thankful for our daily work. We are thankful for our patients and being able to look back at the ways God has used us to impact their lives. And we are hopeful for what comes next.